No, I don't mean Maynard Krebs. I'm talking about a pattern that has become very familiar over the last month or so and in a yarn that feels that way, too. It's my second time around with this one. For some reason I felt the need to try for an almost totally seamless experience, and instead of a funky color, I wanted something more traditional. So here it is. I got the idea to make it with fewer seams from Linden, of Stockinette, whose sweater turned out so great it gave me courage to try. I wrote down every step of my modifications to share if it happened to turn out perfect. But, having knitted it both ways, I have to say I liked the first way best. 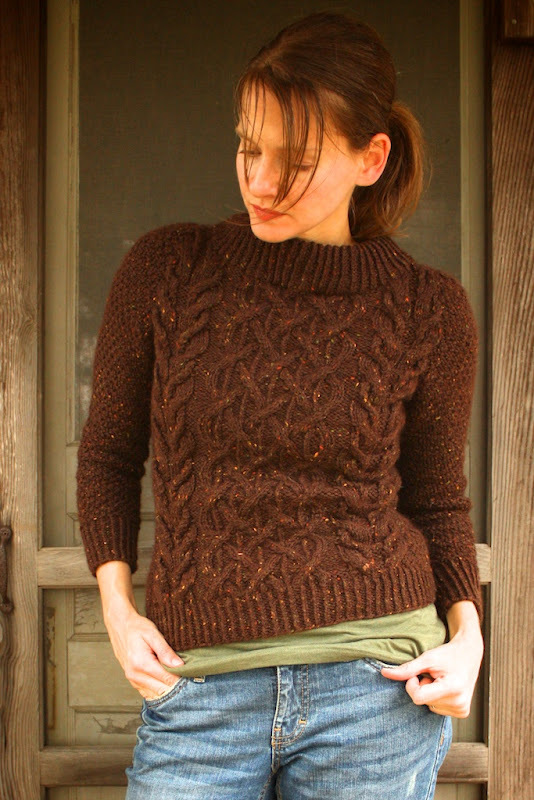 I won't even bother with posting the mods for this one, except to say that it is way easier to knit the body in the round up to the arms, then separate the front and back to work individually before seaming them together at the shoulder. 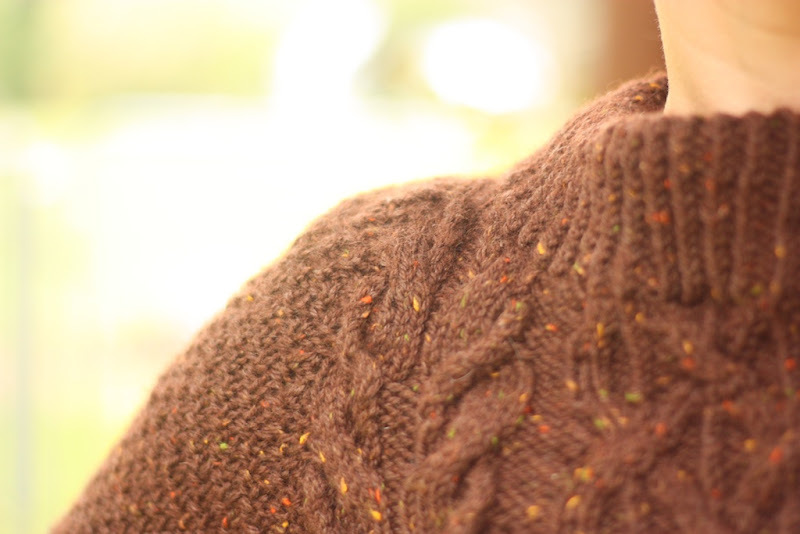 You can veg out in front of the tv then to knit the sleeves two at a time and seam them in. You also have the option of picking up stitches at the armholes and knitting each sleeve in the round from there, but I wouldn't. 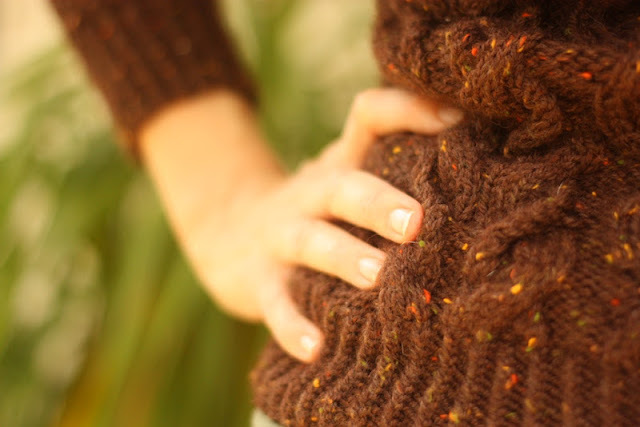 Necessary mods- knitting in the round to the arms and lengthening the 3/4 sleeve just a bit. 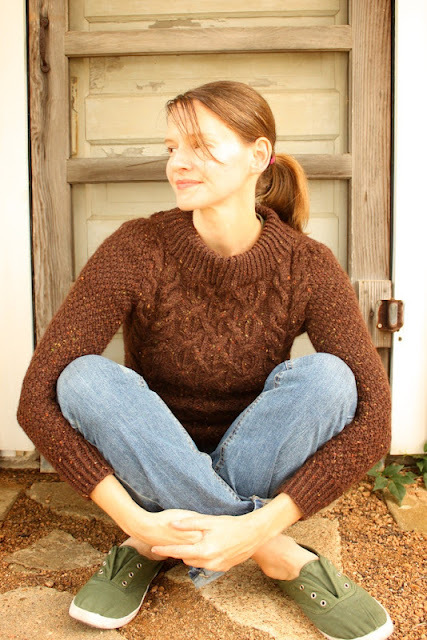 My unnecessary mods - I made the mistake of trying to keep the sweater together in the round, adding sleeves (knit in the round) at the armpit and keeping it all together for a bit before working my decreases with short rows. I just didn't think it through because after putting underarm stitches on waste yarn and knitting the body and sleeves together for a round, there was only one more round to knit even before having to separate the sections and turn back and forth to work short rows in each one, putting stitches on waste yarn as I moved to the next section. Keeping up with all of the turning, the cable patterns and neck decreases was like taking a hard class. There was no watching Friday Night Lights at that point. I was in the zone, like when my husband plays video games. I can't be responsible for any information given to me by my family at times like that, because I won't retain it. "Oh, you got in a fight at school... yeah... that's nice...." "Your camp money was due today... okay... that's good." "You got a ticket... wow... that's nice." I did, however, gain more insight into decreasing without binding off. 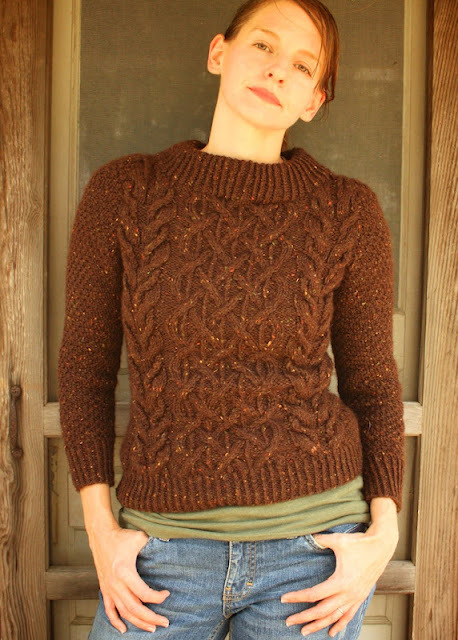 I have had little experience with short rows on the body of a sweater, so that was kind of cool. Actually it's only cool because the sweater turned out nice. 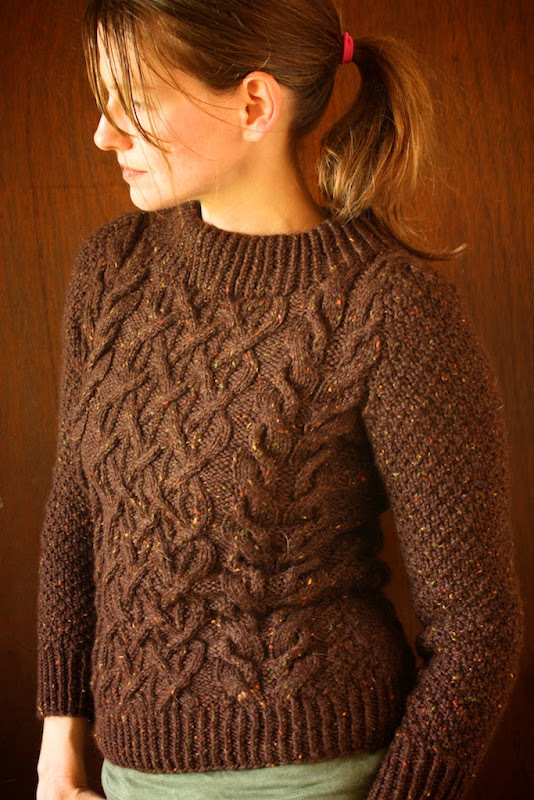 Had it not, I'd be storming through the house in a cloud of doom, raising my fist to curse the day I discovered short rows. I'm so glad there's no doom. And my predictions for sweater growth were on target. I knit it to be very fitted (the smallest size) and after washing and blocking the Patons Classic wool, it's a little loose on me like I'd hoped. Now, I guess I'll wait for next winter. Has anyone ever planned a trip to a colder climate just to wear sweaters? I love this, although I don't have quite the same figure! Thank you, Sarah. 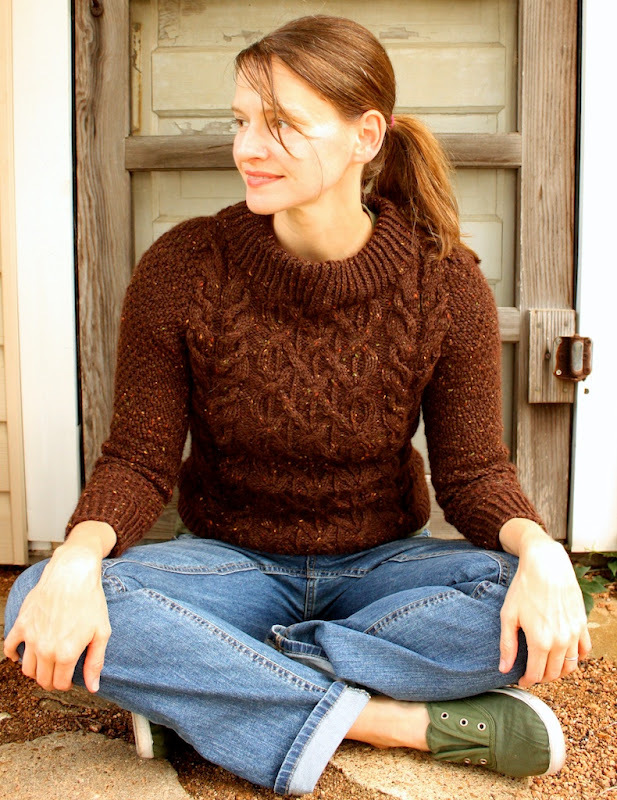 If you're a knitter, you should give this pattern a try. At this moment there are 626 beatnik sweaters profiled on Ravelry made by women of all sizes and ages and in every conceivable color. (This is one reason why I love that site.) I can honestly say every single one that is completed looks good. That is how classic this design is.